Food Safety, and meat processing principles. The 2-year program requires successful completion of four elements for graduation and subsequent distinction as “Master Meat Crafter”. Acceptance into this program will be based upon the quality and content of the required training program application. Applicants with at least 5-years of experience in ownership, operation, or employment in a meat processing establishment will be viewed favorably. However, other backgrounds will be considered for admission. The program is limited to 30 participants per class. 3) Learn new principles, concepts, and technologies. A blend of classroom presentations, manufacturing demonstrations, and product sampling are used to reinforce important Meat Science concepts. Participants will be required to conduct an in-plant research project. Projects are selected by the MMC candidate, discussed and developed among peers within the program, and approved by the training program personnel. As a project example, a candidate might choose to research the role phosphates have on cook yields. That individual would need to develop an experimental plan (including experiments) and conduct the necessary research in their respective establishment including identifying treatments, conducting product trials, collecting data, and any other important aspects to thoroughly and effectively understand the role phosphates have on cook yields. Upon completion of the in-plant research, the candidate must write a formal report explaining the project. Scheduled project progress reports will occur as needed throughout the training program. A final written report will be required for program completion. A formal presentation of the research project will occur during the graduation program in 2020. 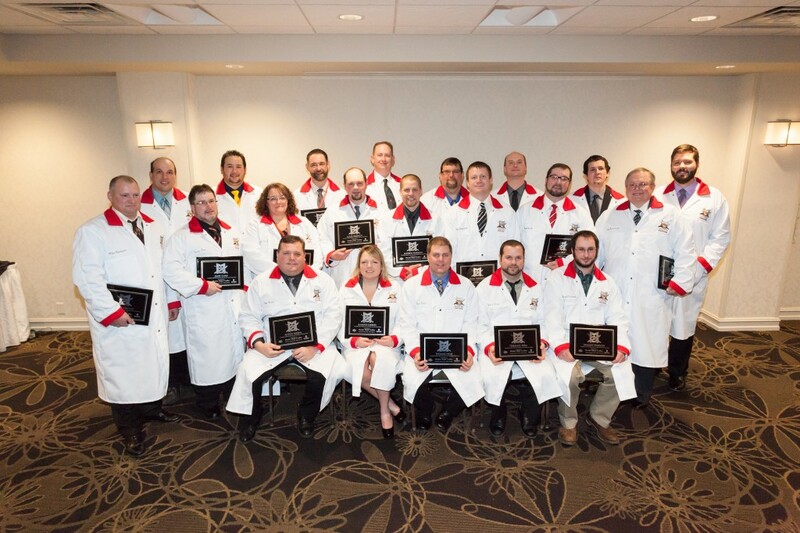 Each participant will be expected to mentor an employee or another individual on various meat science and meat processing topics based upon the knowledge and principles learned from Master Meat Crafter Training Program. Participants must develop their own mentoring program (approved by training program personnel) prior to the beginning of mentoring. At least six homework assignments will be administered throughout the program to expand on specific learning objectives. banquets, and other activities and materials included in the program. The 2012-2014 Class of Master Meat Crafter Graduates. 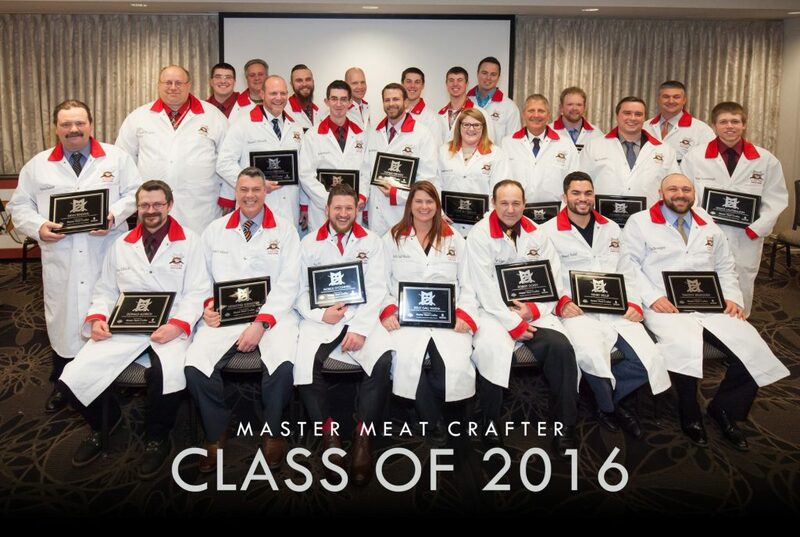 Master Meat Crafter Graduates: Back row of 6:(from left to right): Roy Barden (Pardeeville, WI), Louis Muench (Louie’s Finer Meats; Cumberland, WI), Rick Reams (RJ’s Meats & Groceries; Hudson, WI), Bennett Fraboni (Fraboni’s Italian Specialties; Monona, WI), Dusten Hoesly (Hoesly’s Meats; New Glaris, WI), Mike Clark (Lodi Sausage Company; Lodi, WI); Middle row of 5 (from L to R): Craig Huth (Richland Locker; Richland Center, WI), Jeff Roberts (Glenn’s Market & Catering; Watertown, WI), Jusdon Rechek (Rechek’s Food Pride; Beaver Dam, WI), Andy Geiss (Geiss Meat Service; Merrill, WI), Dave VanHemelryk (Maplewood Meats; Green Bay, WI); Front row of 6 (from L to R): Nate Barden (Pardeeville, WI), Jacob Sailer (Sailer’s Food Market & Meat Processing Inc; Elmwood, WI), Jim Johnson (Otto’s Meats; Luxemburg, WI), Matthew Bayer (Country Fresh Meats; Weston, WI), Jennifer Hoeppner (Quality Cut Meats; Cascade, WI), and Jeff Schmalfeldt (Lake Geneva Country Meats Inc; Lake Geneva, WI). The 2010-2012 Class of Master Meat Crafter Graduates. Row 1 (seated left to right): Anton Washa (Foley Locker, Inc. Foley, MN), Jennifer Dierkes (McDonald’s Meats, Inc. Clear Lake, MN), Thomas Heise (Custom Meats of Marathon, Inc. Marathon, WI), Terrance Prem (Prem Meats, Spring Green, WI), Bradley Pearson (Lodi Sausage Co. Lodi, WI). Row 2 (left to right): Mike Flanigan (Northwoods Locker, LLC. Clayton, WI), Jamie Cline (T.A. Solberg Co. Rhinelander, WI), Gidget Joyal (Johnsonville Sausage LLC. Sheboygan Falls, WI), Louis Muench (Louie’s Finer Meats, Inc. Cumberland, WI), Andrew Pearson (Sixth Street Market Ashland, WI), John Franseen (Hewitt Meat Processing, Inc. Marshfield, WI), Joel Reck (Ski’s Meat Market, Stevens Point, WI) Ralph Krawczyk (Wixon Inc. St. Francis, WI). 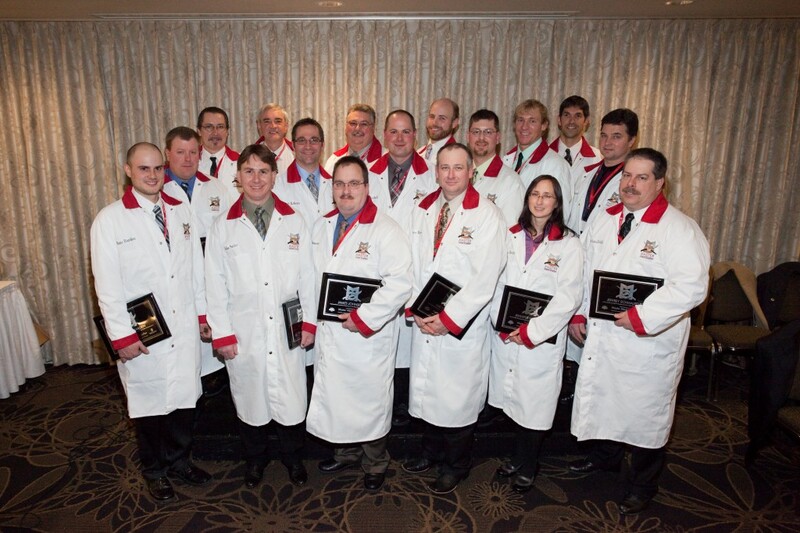 Row 3 (left to right): Nathan Jorgensen (Peroutka’s Meat Processing, Antigo, WI), Kurtis Lam (Fox Brothers Piggly Wiggly, Oconomowoc, WI), William Muench (Louie’s Finer Meats, Inc. Cumberland, WI), Philip Schmidt (The Meat Block LLC, Greenville, WI), Mark Hanni (PS Seasonings and Spices, Iron Ridge, WI), David Mauer (Wisconsin River Meats, Mauston, WI), Chad Nolechek (Nolechek’s Meats, Inc. Thorp, WI), Anthony Reams (RJ’s Meats and Groceries, Hudson, WI).